Chase Field is the site of the matchup between the San Diego Padres and the Arizona Diamondbacks on Friday, September 8, 2017. The probable starting pitchers are Jordan Lyles for the Padres and Patrick Corbin for the Diamondbacks. San Diego opens at +233 while Arizona opens at -255. The Padres have a 71-61-8 over/under record and a 75-65-0 run line mark. The Diamondbacks are 79-61-0 against the run line and have a 63-70-7 over/under record. The Padres have a 62-78 overall record this season. Starting pitcher Jordan Lyles has a 0-2 record with an earned run average of 6.71 and a WHIP of 1.63. He has 36 strikeouts over his 51 innings pitched and he's given up 67 hits. He allows 11.8 hits per 9 innings and he has a FIP of 5.7. The bullpen has an earned run average of 4.35 and they have given up 405 base hits on the year. Teams are hitting .225 against the bullpen and they've struck out 510 hitters and walked 179 batters. As a team, San Diego allows 8.7 hits per nine innings while striking out 8.4 batters per nine innings. They are 15th in the league in team earned run average at 4.48. The Padres pitchers collectively have given up 1,199 base hits and 618 earned runs. They have allowed 188 home runs this season, ranking them 10th in the league. San Diego as a pitching staff has walked 479 batters and struck out 1,154. They have walked 3.5 men per 9 innings while striking out 8.4 per 9. They have a team WHIP of 1.35 and their FIP as a unit is 4.56. As a team San Diego is hitting .232, good for 30th in the league. The Padres hold a .394 team slugging percentage and an on-base percentage of .299, which is good for 30th in baseball. They rank 30th in MLB with 7.7 hits per game. Wil Myers is hitting .239 with an on-base percentage of .324. He has 118 hits this season in 493 at bats with 64 runs batted in. He has a slugging percentage of .444 and an OPS+ of 103. Manuel Margot is hitting .263 this year and he has an on-base percentage of .310. He has totaled 109 hits and he has driven in 34 men in 415 at bats. His OPS+ is 92 while his slugging percentage is at .417. The Padres have 1,076 hits, including 190 doubles and 168 home runs. San Diego has walked 405 times so far this season and they have struck out 1,297 times as a unit. They have left 890 men on base and have a team OPS of .693. They score 3.81 runs per contest and have scored a total of 533 runs this year. Arizona has a 82-58 overall mark this year. With an earned run average of 3.83, Patrick Corbin has a 13-11 record and a 1.39 WHIP. He has 158 strikeouts over the 164.1 innings he's pitched. He's also given up 182 hits. He allows 10 hits per nine innings and his FIP stands at 3.93. The bullpen has an earned run average of 3.76 and they have given up 384 base hits on the year. Teams are hitting .235 against the Diamondbacks bullpen. Their relievers have struck out 422 batters and walked 163 opposing hitters. As a team, Arizona allows 8.1 hits per nine innings while striking out 9.3 batters per nine innings. They are 3rd in the league in team earned run average at 3.55. The Diamondbacks pitchers as a team have surrendered 1,125 base knocks and 492 earned runs this season. They have given up 146 home runs this year, which ranks 29th in Major League Baseball. Arizona as a staff has walked 444 hitters and struck out 1,286 batters. They give up a walk 3.2 times per 9 innings while they strike out 9.3 per 9. Their team WHIP is 1.26 while their FIP as a staff is 3.74. As a team, they are batting .254, good for 17th in the league. The Diamondbacks hold a .442 team slugging percentage and an on-base percentage of .328, which is good for 13th in baseball. They rank 16th in MLB with 8.7 hits per contest. 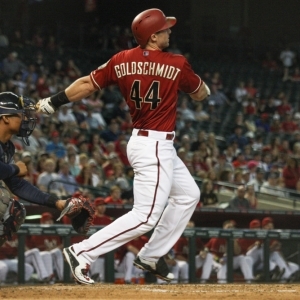 Paul Goldschmidt comes into this matchup batting .314 with an OBP of .424. He has 152 hits this year along with 109 RBI in 484 AB's. He maintains a slugging percentage of .597 with an OPS+ of 154. David Peralta is hitting .297 this season and he has an OBP of .350. He has collected 136 hits in 458 at bats while driving in 45 runs. He has an OPS+ of 100 and a slugging percentage of .450. The Diamondbacks as a unit have 1,213 base hits, including 272 doubles and 187 homers. Arizona has walked 494 times this year and they have struck out on 1,290 occasions. They have had 968 men left on base and have an OPS of .770. They have scored 4.96 runs per game and totaled 694 runs this season. Who will win tonight's Padres/Diamondbacks MLB game against the spread?